Meanwhile, the extension of the Central Secretariat line also witnessed controversy, with heritage conservationists and ASI objecting to its alignment. The corridor passes near some of the oldest and most popular monuments in Delhi, including Red Fort, The National Monuments Authority is expected to take a call. However, the silver lining is that work on the rest of the third phase has started. From installing top-up machines for smart cards to introducing six and eight coach trains, Delhi Metro referred to as the city’s “lifeline” has made travel easier for most of the population. With glitches here and there, DMRC has managed to bring out some positive changes to the city’s landscape. Metro introduced its first eight coach metro on Monday with more to be introduced in the coming months. However, the biggest setback was the shutting down of the ambitious airport express line. It has remained suspended from July 8 following structural faults. The fate of the high-speed train run by Reliance Infrastructure is still hanging in the middle with the centre announcing a fresh deadline of resuming operations by December end or early January. Metro stations became favourites spots for committing suicide after which officials decided to raise the height of railings at elevated stations, but there hasn’t been much progress. Delay in inducting Metro feeder buses is another issue. Though the tender for the non air-conditioned feeder buses was issued in October last year, the process of procurement is still going. They are not expected to hit the roads till mid-2013 when they were supposed to be inducted by July this year. Delhi Metro, which opened to the public on 25 December 2002, has completes 10 years of service on Tuesday. Phase 1 which covered 65 kms was completed in 7.3 years and another 125 kms was added in less than five years under phase 2. With work beginning for phase 3, Delhi Metro Rail Corporation plans to complete its 140 kms project by 2016. Slow pace of land acquisition for proposed Metro stations and delay in getting a green signal from National Monuments Authority for the construction on the Central Secretariat-Kashmere Gate Corridor for the heritage line are some of the major issues leading to delay in beginning proper work under Phase 3. Permission from the government for chopping 12,000 trees is also awaited. “Civil work is in progress between Moti Bagh and Delhi Cantt, Mukundpur and Azadpur areas. Initial work on the Naraina stretch has also begun on the Mukundpur-Shiv Vihar corridor,” said a DMRC official. On the Janakpuri West-Botanical Garden corridor, initial work has been initiated on the Kalkaji-Kalindi Kunj route. Since permission from NMA is awaited for the heritage corridor on preparatory work has started at the Kashmere Gate Metro station. Work has begun on the entire stretch of the Jahangirprui-Badli and Badarpur-YMCA Chowk corridors. For the Dwarka-Bahadurgarh stretch not much work has been initiated as officials are still at the stage of finalising the alignment and preparation of tender documents. “We are optimistic about completing the phase 3 project by 2016 which will be another milestone,” added the official. A baby named Maitri was born in July inside the Metro while her mother was on her way to hospital. DMRC has also introduced “more cards” this year which will link travellers to various other forms of transport. DMRC has been certified by the UN as the first Metro rail system in the world to get carbon credits for reducing greenhouse gas emissions and reducing pollution levels in the capital by 6,30,000 tonnes every year. The average footfall is 20 lakh with yellow line (HUDA City-Jahangirpuri) registering nearly 5.5 lakh commuters daily and blue line (Noida-Dwarka) registering about 6.5 lakh on a daily basis. Complete shutdown of the Airport Express line was a major setback for the Delhi Metro, reports DHNS. This 22.7 kms corridor, which is India's first public private partnership project, was temporarily shut on July 8 after the Reliance Infrastructure-led consortium found some defects on the civil structure and brought them to the notice of the Delhi Metro. The urban development ministry had set up a committee comprising officials from the Indian Railways, Delhi Metro and Reliance Infrastructure to look into the nature of the defects. Since then repair has been going on and was completed last month. The deadline for resuming services of this Rs 5,700 crore line has been extended since October but is still hanging in the middle. In the light of the extensive repair work carried out, a fresh safety inspection by the Commissioner for Metro Rail Safety (CMRS) was sought. DMRC is hopeful that services will resume by January next year. ढुलमुल रवैये से कहीं मिस न हो डेडलाइन! NOIDA: The Noida Authority has decided to construct a second station close to the existing Botanical Garden Metro following its expansion plan to cater to the projected increase in footfall once the Kalindi Kunj link is completed. The new station will be constructed within the Botanical Garden area on Master Plan Road-III. In June, the Authority had written to the state environment ministry requesting for permission to use some part of the Botanical Garden land for Metro expansion work. The ministry has granted permission to use about 10 acres of the land and the Authority has decided to use five acres to construct the second station. The remaining five acre land will be used for a multilevel parking lot to be built by DMRC and for two slip roads that will be constructed by the Noida Authority. Earlier, after a meeting between the Noida Authority and the Delhi Metro Rail Corporation, it was decided that following the extension of the existing Metro line up to Kalindi Kunj in Delhi, the Botanical Garden station will be made a junction with broad gauge and standard gauge lines. Hence, the existing station needs to be expanded. According to a senior official, the Authority will hand over part of this five acre land adjoining the existing Botanical Garden Metro station to DMRC for the parking facility that will have a capacity of 4,000 vehicles. Commuters heading towards Akshardham or Kalindi Kunj will be able to use the parking lot. At present, only 500 vehicles can be parked in the existing parking lot at the station. Work on the parking project will be completed within 18 months from the time it begins. "Following the extension of the existing Metro line, the Botanical Garden station will be made a junction with broad gauge and standard gauge lines. As a result, the station will witness a major increase in footfall as well as vehicular traffic. We have decided to construct a second station as well as a parking lot to cater to this increase in numbers," a Noida Authority official said. "The two slip roads will provide a smooth access for commuters to the station and the parking lot from the main Master Plan Road-III," he added. The Authority is likely to begin work on the design and feasibility of the new station by the end of this month. Work on the extension of the Botanical Garden-Kalindi Kunj Metro line is expected to begin in December. Noida: The Delhi Metro Railways Corporation has once again started construction of bridge linking Kalindi Kunj and Botanical Garden Metro Station. The work of under construction metro bridge halted after the water level of Yamuna started increasing due to rainy season. Now, the water level have receded the construction works have restarted. The 3.962 kilometer long stretch of metro track between two locations is being constructed across the Okhla Barrage. Built at an expenditure of Rs. 64 crores five pillars are being raised to construct the metro track over sandy soil. Earlier before putting the work on a halt the construction company worked day and night to raise the pillars at a height so that flooded river doesn’t harm it. Earlier the work could not be continued for about a month due to the flood in Yamuna river and now that the Hathinikund Barrage has stopped releasing water the work could be resumed. The bridge is being constructed at British-German Standard using Advanced Jackdown Methods. A total of 14 pillars will be built over Yamuna to support the metro track. Out of these five are almost nearing completion and work on remaining nine will start now. The DMRC expects to complete the work within its deadline. 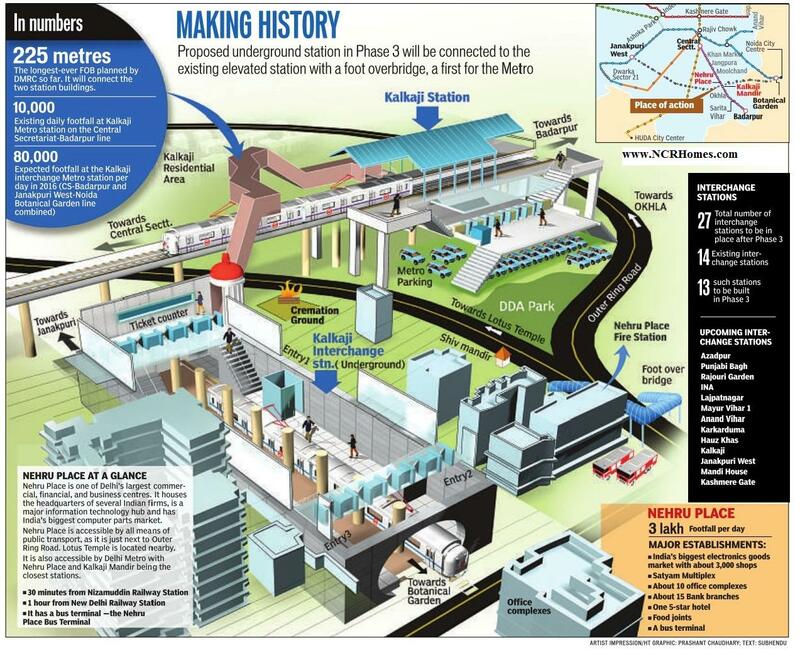 NEW DELHI: Getting to Nehru Place is set to get easier with Delhi Metro planning to build a station on Outer Ring Road. Located opposite to Paras Cinema, the underground station will connect surrounding areas like Nehru Enclave, Kalkaji and Chittaranjan Park to Noida and the domestic terminal of the IGI airport. Nehru Place already has a Metro station located next to International Trade Tower. The second station will be part of the Janakpuri (west)-Botanical Garden corridor. "As per the detailed project report (DPR), 19,546 people are expected to use the underground station in 2016," said a Delhi Metro Rail Corporation (DMRC) official. The location of the station — near the intersection next to Paras cinema — will make its construction quite challenging as it is one of the busiest crossings in the city. DMRC officials said that no traffic plans have been finalized till now, as the contractor for the tender is yet to be decided. "The traffic plan will be drawn up after consultations with the police. But it'll only happen once the contract is awarded," added the official. There will be five entry and exit points to the station. "While one entry point will be near Paras Cinema, the other will come up on the road leading to Lady Shri Ram College. Three other entry points will be built near Nehru Enclave and Veer Savarkar School near Nehru Place," said the DMRC spokesperson. There will not be though, any direct connectivity with the existing Nehru Place metro station. For easier connectivity, Delhi Metro is also planning to construct a subway across the busy Outer Ring Road. "Nehru Place is a busy area since it's the city's information technology hub. The station will tremendously cut down travel time for commuters travelling from here to NCR areas," said an official. The existing station is part of the Central Secretariat-Badarpur corridor. "By 2031, more than 30,000 commuters are expected to be benefitted by this service. Apart from the Nehru Place market, many nearby residential areas such as Nehru Enclave, Kalkaji and Chittaranjan Park will also be connected," said the spokesperson. DMRC says the tender has already been floated and the contract is expected to be awarded by next month. Construction work is slated to begin by the year end. S K Diwedi, the chief executive officer of Noida, says: "The proposed line will be a part of the DMRC's larger plan to link Jahangirpuri and Kalindi Kunj. Noida Authority and DMRC officials are reviewing the plans twice in a month." The new link will also be a part of DMRC's Phase III expansion plan, which will now cover 105km, instead of the earlier proposed 70km, to enter areas like Faridabad and Noida. In addition, Noida will also be floating the tender for the extension of the Metro line from Noida City Centre to Bodaki in Greater Noida. Rama Raman, the chairman and chief executive officer of Greater Noida Industrial Development Authority (GNIDA), says: "Once the project is complete, it will be easy to move from Delhi to Noida-Greater Noida and Ghaziabad, as the authority has designed this Metro connectivity project. The authority is approaching financial institutions for viability gap funds and tax exemptions to meet the requirement. According to the alignment, 22 Metro stations have been proposed in the 28kmlong Noida and Greater Noida Metro link, which costs around 5,500 crore. Nearly 65,000 passengers are expected to commute daily on this line. This Metro link will connect with Ghaziabad in the second phase of execution." One of Delhi's main commercial centres housing India's biggest computer market, offices, hotels and banks, Nehru Place is all set to become a major Metro hub as well. A couple of hundred metres from the elevated Kalkaji Metro station, Delhi Metro Rail Corporation (DMRC) is planning a new undergrpound station on the proposed Janakpuri West-Botanical Garden (Noida) route in the third phase of its expansion. Both stations off the outer ring road -and a 225-metre foot overbridge to link them, a first for the Delhi Metro -will act as major interchange facility for the Janakpuri WestBotanical Garden and the existing Central SecretariatBadarpur lines at Nehru Place. The Kalkaji Interchange Metro Station, as it is named, will benefit thousands of commuters with the facility directly connecting Noida, Faridabad and south Delhi to IGI Airport. The new station will have three entry/exit points: one near the Nehru Place bus terminal and the other two towards the Nehru Place complex. According to a detailed project report (DPR) for Phase 3, the Kalkaji station registers a footfall of about 10,000 commuters every day. Once it becomes an interchange hub, it is expected to cater to 80,000 commuters per day, the DPR states. The Kalkaji interchange station is also expected to boost tourism as the Lotus Temple and Kalkaji Temple are at a walking distance, an official said. “Such a plan was espoused due to the lack of adequate land near the existing station. There is a cremation ground and fire station nearby, so the new station is being built at a distance,“ said Anuj Dayal, DMRC spokesperson. Tenders will be floated by March and civil work is expected to start by July. The facility is likely to be in place by 2016 when Metro's 120-km Phase 3 expansion will be operational. In this phase, the Central Secretariat-Badarpur line will be extended to YMCA Chowk in Faridabad. This extension, the interchange facility near Kalkaji Metro station and a similar facility at Hauz Khas station will improve connectivity to the three NCR towns. The Noida authority has completed preparations for a new Metro link between Noida and south Delhi. authority. The authority now expects NOCs from various other departments, including those looking after sewer, electricity and water supplies. “Once these formalities are completed, the authority will sign a MoU with the Delhi Metro Rail Corporation (DMRC). Work on the new line will begin soon,” said a Noida authority official. The entire line will be elevated. The maximum speed for Metro trains will be 85 kmph. The average speed will be 32 kmph. The authority will also set up a dedicated power sub-station for the new Metro line. The project for the construction of the 3.9-km line between Noida’s Botanical Garden and Kalindi Kunj in Delhi would cost Rs 874 crore. As of now, Delhi Metro enters Noida and Ghaziabad via east Delhi. The new route will provide a direct link with south Delhi areas such as Kalkaji, Malviya Nagar, Green Park and Vasant Kunj. Presently, people have to take the Noida-Dwarka route and get down at Rajiv Chowk station to change lines. The new plan will make these trips shorter. Work will begin soon and the new line will be opened for public by 2016. The line will have three stations: Botanical Garden, Amity School and Kalindi Kunj. 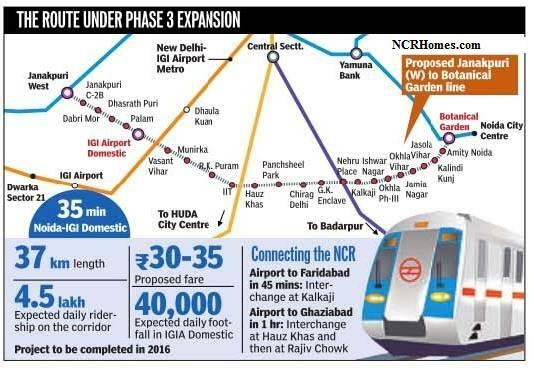 “The new line will be built as part of the third phase of DMRC’s expansion plans to enter outer Delhi areas,” said Chandra Bhanu Singh, deputy chief executive officer, Noida Authority. In four years from now, travelling from Noida to the Delhi airport to catch a lowcost airline won't be high-cost. The Delhi Metro will construct a 37-km corridor in phase 3 of its construction, connecting the NCR city to the domestic terminal at the Indira Gandhi International (IGI) airport. The route is scheduled to start operations in 2016, proving to be a big relief for Noida's residents. Three low-cost airlines -Indigo, Go Air and SpiceJet -fly from Terminal 1D at the airport. Sources said around 40,000 passengers take flights from there every day. The international airport (Terminal 3) got connected through the Airport Metro Express last year. Travelling between Noida and the Delhi airport is a headache at the moment. Autorickshaws are not allowed between the two cities and the bus service is infrequent. Taxis charge R600800 for a trip to the airport. While a taxi ride from Noida to the airport takes an hour or more, the Metro is expected to cut down the travel time to around 30 minutes and the cost to a fraction. The proposed Metro line connecting Janakpuri West to Noida's Botanical Garden will pass through the domestic airport. “The distance between Botanical Garden and the domestic terminal would be covered in 35 minutes and the fare would be between R30 to R35,“ said a Delhi Metro Rail Corporation spokesperson. Delhi Metro officials said once the corridor is operational, over 40,000 people will use the Metro station at IGI airport every day. In five years, no Noida resident will have to leave his home at 6.30am to catch a 9am flight. On the lines of the London Tube, commuting to the domestic terminal of the IGI Airport will be easy through a new Metro link. The domestic terminal (T1D) will be connected to the rest of the city in Delhi Metro's phase 3 expansion, scheduled to be completed by 2016. 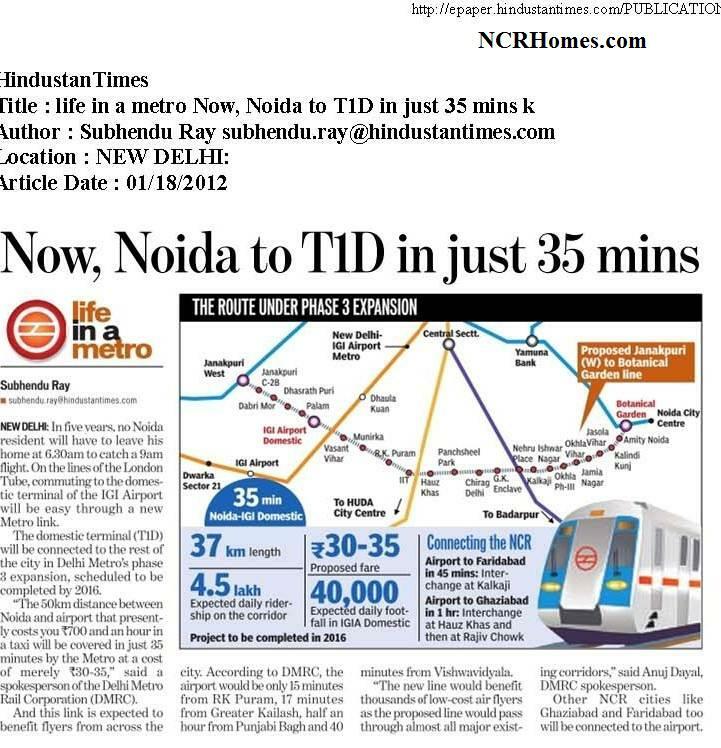 “The 50km distance between Noida and airport that presently costs you R700 and an hour in a taxi will be covered in just 35 minutes by the Metro at a cost of merely R30-35,“ said a spokesperson of the Delhi Metro Rail Corporation (DMRC). And this link is expected to benefit flyers from across the city. According to DMRC, the airport would be only 15 minutes from RK Puram, 17 minutes from Greater Kailash, half an hour from Punjabi Bagh and 40 minutes from Vishwavidyala. “The new line would benefit thousands of low-cost air flyers as the proposed line would pass through almost all major existing corridors,“ said Anuj Dayal, DMRC spokesperson. Other NCR cities like Ghaziabad and Faridabad too will be connected to the airport. The upcoming Phase III of Delhi Metro Rail Corporation (DMRC) is all set to reduce the commuting time between the two ends of the city — Noida and Gurgaon. The two major NCR stations, with scores of people traveling to and fro at current, are more than one and a half hours apart. In order to facilitate this corridor, the upcoming Janakpuri West – Botanical Garden link will have an interchange facility at Hauz Khas Metro Station so that passengers coming from Gurgaon can get down at there and take a direct train to Botanical Garden in Noida. "Presently, the Metro journey from Huda City Centre to Botanical Garden in Noida takes about 1.5 hours with the interchange at Rajiv Chowk. Therefore, traveling time will come down by more than half an hour. This corridor is expected to be operational by 2016," a DMRC spokesperson said. However, the significant development through Phase III will be that the current total number of stations from Huda City Centre to Botanical Garden, which is 34, will come down to only 25 stations. Also, the busy Rajiv Chowk station will be missed since it is not being included in the route. The approximate time to commute between the two destinations will be about 50 minutes. The Hauz Khas Metro Station will be turned into an interchange station to facilitate this connectivity. A parallel new station will come up, connected with the presently operational station, through a ramp. About 1,69,414 passengers are expected to use the station by 2016. "Thousands of office goers travel between Gurgaon and NOIDA daily. A road journey between the two cities also takes around 1.5 hours. Absence of direct autos and infrequent bus services further add to the inconvenience of the people who commuting between these cities. The new corridor will be a major benefit for all such commuters," said a spokesperson. NEW DELHI: It's official. Delhi Metro is going to Noida again. The new 3.5km line, an extension of the Janakpuri (west)-Kalindi Kunj corridor, will go on till Botanical Garden via Amity. To reach Amity in Noida, it will cross the Yamuna along the Okhla barrage and thereafter, culminate at the existing Botanical Garden station. Sources said that the Noida authority had approved the line in principle but a written approval was yet to come. Delhi Metro has already come out with a tender for the construction of the connecting bridge for the extension. The extension is likely to cater to a large section of commuters from both the NCR town and parts of west and south Delhi. The Dwarka sector 21-Noida city center corridor or the blue line, which is one of the corridors with high ridership, already goes to Noida. The new line will connect the NCR with areas like Vasant Vihar, Munirka, Hauz Khas, Greater Kailash Enclave, Nehru Place and Jasola Vihar. It is also expected to take off some of the load off the blue line, which clocks 15-17 lakh passengers on weekdays. The existing station at Botanical Garden will be converted into an interchange station and the stretch from Kalindi Kunj to Botanical Garden will be elevated, said Delhi Metro Rail Corporation (DMRC) officials. The bridge connecting the station at Kalindi Kunj and the Botanical Garden via Amity is not the only bridge to come up in Phase III of the Delhi Metro network. The Mukundpur-Yamuna Vihar corridor in this phase also has a bridge crossing the Yamuna, as reported by TOI earlier. The bridge for the Noida extension will be 574m long with a span of 42m. It will be constructed about 85 meters downstream of the existing Okhla bridge, according to the tender issued by DMRC. Officials said the bridge piers would be such that these did not obstruct the water way of the existing Okhla barrage bridge upstream. The bridge on the Mukundpur-Yamuna Vihar line will, however, be constructed about 83 metres downstream of the existing Nizammudin bridge. Delhi Metro had built two bridges on the Yamuna during Phase I and II. While a bridge connects Kashmere Gate with Shastri Park station, another connects Indraprastha with Yamuna Bank in east Delhi. The empowered group of ministers on urban infrastructure had on August 9 cleared the proposal at a cost of Rs 35,242 crore, including central taxes. execution can be started in three months," he said. In March, the authority gave a formal sanction to this 3.76km Metro route between Noida's Botanical Garden and Kalindi Kunj near Sarita Vihar in Delhi. Two of the stations – Botanical Garden and Kalindi Kunj (near Amity – of the proposed link) will fall in Noida. "This is part of our plans to have greater connectivity with adjoining areas. DMRC's detailed project report (DPR) pegs the project's total cost at R786 crore. The cost will be borne by the authority," said a senior official. This line will be part of DMRC's plan to link Jahangirpuri and Kalindi Kunj. Noida Authority and DMRC officials will decide on the alignments. Once the line is operational, Noida will have a direct link with south Delhi areas like Kalkaji, Malviya Nagar, Green Park and Vasant Kunj. Presently, people have to take the Noida-Dwarka route and get down at Rajiv Chowk station to change lines. "The state government has approved the plan in-principle. Once the line is operational, it will be connected to the existing Dwarka-Noida and the proposed Noida-Greater Noida routes. It will be a part of DMRC's Phase-III expansion plans," said an official in Lucknow. NOIDA: Decks will soon be cleared for the much-awaited Metro expansion to Botanical Garden and to sector 62 in Noida next week. The Noida Authority and DMRC officials are slated to meet next week to decide on the alignment of the 3.76 km long Metro link between Kalindi Kunj and Botanical Garden. The DMRC will also present its Detailed Project Report on the expansion of the existing City Centre line up to sector 62. The Noida Authority had approved the Kalindi Kunj-Botanical Garden expansion in March this year at a cost of Rs 786 crores. The DMRC had also presented its DPR. "The alignment of the proposed route has been delayed as it is a critical one with the Okhla Bird Sanctuary and the Sarita Vihar bus depot falling along it," said an official. The entire cost of this expansion, an extension of Delhi Metro's Phase-III plan of connecting Kalindi Kunj to Outer Ring Road, will be borne by the Authority. The Authority will also discuss the details of its plan to expand the existing Noida Metro line up to sector 62. DMRC will present a DPR on the new link that is expected to benefit thousands of people who commute within Noida and to Ghaziabad as this line will also provide an accessible link to NH-24. The Authority has also proposed to link the sector 62 Metro line to the proposed Vaishali to Shipra Sun City link once the latter becomes operational. While the details of the sector 62 metro link expansion were slated for a discussion in the Authority's board meeting last month, the same got delayed as the two parties could not agree on the estimated cost of the project. "The sector 62 plan has been in the pipeline for some time now. It was supposed to be executed before the Greater Noida line, but that could not be done due to revenue viability issues," an official said. In February this year, the Centre as well as the state government had offered financial assistance for the project but the Authority had declined the same. The Authority has now decided to generate revenue by granting land rights to private players along this route for commercial development. As per the current plan, shopping malls, swanky office spaces and group housing schemes will dot the proposed route between the City Centre sector 32 and sector 62 stations. The same proposal will be extended towards the stations of Noida-Greater Noida Expressway, Knowledge Park 4 via Pari Chowk and Badoki in Greater Noida. The areas that will have Metro connectivity are sectors 32, 34, 35, Hoshiyarpur, sector 51, 52, 71, Noida Extension Marg, Sarfabad, sector 60, 61, 62, 63 and NH 24.
to move within Noida and Greater Noida in a much better way. From City Centre to NH-24 via Sector 71 (covering a major part of the city), from Sector 71 to Bodaki in Greater Noida via Sector 121 (this covers the Noida Extension area), from Kalindi Kunj to Botanical Garden (connecting Noida to South Delhi) and from Sector 94/124 to Sector 142 via Sector 44 (allowing Greater Noida residents to go to South Delhi without coming to Noida). Though Metro has proved to be a great relief, intra-city connectivity continues to be a problem. A city of more than 150 sectors, there are only six stations in Noida, catering only to nine immediate and as many adjoining sectors. The Noida board has also approved a direct Metro link between Noida and Delhi’s Sarita Vihar. It’s a 3.76-km Metro route between Noida’s Botanical Garden and Kalindi Kunj near Sarita Vihar. The Delhi Metro Rail Corporation (DMRC) has submitted a detailed project report (DPR) which puts the total cost at Rs 786 crore. This 3.76-km line will be part of DMRC’s larger plan to link Jahangirpuri and Kalindi Kunj. A DPR for the entire plans has been prepared too. NOIDA: The Noida, Greater Noida and Yamuna Expressway authorities on Monday have planned for large scale infrastructure development across Gautam Budh Nagar district. In a joint board meeting, the major focus of the Authorities remained on providing connectivity within the district as well as with Delhi. "In the next four years, Rs 20,000 crore will be spent on the projects," said Mohinder Singh, chairman of the Authorities. To begin with, the authorities have approved a major detailed extension of the Metro route connecting almost all of Noida and Greater Noida at a cost of Rs 10,000 crores, covering a total of 86 km. The route is estimated to be ready in the next three years. Besides extending the existing city centre Metro route connecting Kalindi Kunj and Botanical Garden, a new line from the City Centre station in sector 32 to sector 62, touching NH-24, was also approved. This new 6-km route will be via sector 71 crossing and will provide connectivity to sectors 32, 34, 35, Hoshiarpur, sectors 51, 52, 71, Greater Noida Extension Marg, Sarfabad, sectors 60, 61, 62, 63 and NH 24. A new loop from sector 71 via sector 121 will then join the Greater Noida route between the City Centre and Bodaki railway station in Greater Noida. This route will be from City Centre along the Greater Noida Expressway, touching Knowledge Park 4 via Pari Chowk and will finally end at Bodaki. The new loop has been added mainly to connect Noida extension that falls near sector 121 with Noida as well as with Greater Noida. "With the Metro extension, most sectors will be within walking distance from the stations. Connectivity to Greater Noida will also improve tremendously," Singh said. To smoothen chaotic traffic, the Noida Authority has approved construction of a 5.8 km elevated road parallel to the Shahdara drain. Starting from sectors 14 and 14 A onto sector 95 and Kalindi Kunj, the stretch costing Rs 525 crores will be of four lanes. This route will provide an alternate route between Kalindi Kunj and Noida, thus easing traffic congestion on the expressway. In the meeting, the Authorities also approved the draft master plan for Greater Noida. As per the 2031 Master Plan, a total of 5,04,000 hectares will be developed. Of this, 27.6 per cent area will be reserved for residential development, while 24.2 per cent will be developed as green area. The approved master plan includes six expressways, overbridges, flyovers, warehouses and godowns, besides several residential, educational, industrial and commercial hubs. According to the Authority chairperson, development of these 5,04,000 hectares is crucial as it falls between two major hubs of commercial activity, the eastern freight corridor between Ludhiana and Kolkata and the western freight corridor between Dadri and Mumbai. A state-of-the-art Buddhist museum and a research centre sprawling across 25 acres within the Gautam Budh University campus was also approved in the Monday board meeting. Estimated to cost Rs 84 crores, the project will house art galleries and sculpture sections and various cultural workshops will also be held there. For entertainment and leisure of residents, the Authority plans to construct a modern Laser Park in sector 91. Measuring 29 acres, this park will cost Rs 20 crores and will be the first of its kind in the NCR. It will boast a 3-acre artificial water body, computerized lighting systems besides musical fountains, an amusement area, a marine aquarium, open theatres and walking pathways. d signing of memorandum of understanding between the Noida Authoirty officials and Delhi Metro Rail Corporation (DMRC) is mandatory to ensure immediate construction. The 3.7-kilometre extension will have just one station en route — tentatively named as Amity Metro station for its proximity to Amity University — and will end at the existing Botanical Garden Metro station. The extension is likely to cost R786 crore. While the DMRC will bear the cost of the rolling stock and operational expenditure, the Noida Authority will have to pay for the construction and will have to provide land for construction of the Metro line and the stations. 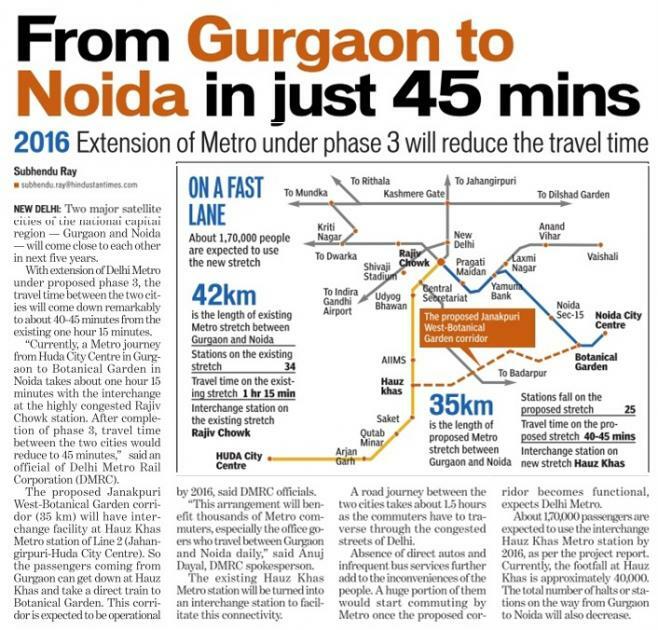 The extension will reduce the distance and travelling time between south Delhi and Noida. Running parallel to outer Ring Road in Delhi, the proposed Janakpuri West — Noida corridor will cut through some prominent residential and commercial hubs in south Delhi. Senior DMRC officials said the section will benefit a large number of people who travel between Noida and south Delhi every day. "This corridor will have two inter-change stations — at Kalkaji on Badarpur line and at Hauz Khas on Gurgaon line —which help people move anywhere in south and central Delhi from Noida and Greater Noida and vice-versa in matter of just few minutes," said a senior DMRC official. Since the Noida Authority is also planning construction of its own light rail transit system between Noida and Greater Noida, this line would virtually bring Greater Noida and south Delhi very close to each other. The 37.2-kilometre corridor — 33.5-km in Delhi and 3.7-km in Noida — will have 24 elevated and 12 underground stations. The line will also serve as an alternate to Dwarka — Noida section for people who travel between west Delhi and Noida.